As we began this grand adventure, I devoted the second installment to those things you spied on the Finder desktop after you’d started your Mac. One of those items was the Dock—the bar at the bottom of your Mac’s screen where you launch applications, access currently running applications, and tuck away items that you want quick access to. This week I’d like to delve a bit deeper into what you can do with the Dock. By way of refresher, the left side of the Dock is devoted to applications—programs that Apple placed there, applications you’ve dragged there, and programs you’ve launched. The right side of the Dock (the area that appears after the divider) is for folders, files, minimized windows, and the Trash. The items in the Dock are aliases of the original items, meaning that when you click the Safari icon to launch the browser, for example, you’re really clicking an icon that represents Safari rather than the true-blue Safari application itself. Because it's an alias you can safely remove it from the Dock by dragging it to the desktop without fear of deleting the original. Note, however, that you can’t drag the icon of an active application to the desktop in the hope that you’ll remove its icon from the Dock. You must first quit the application; once you do, you can remove it. Hover your pointer over a Dock item, and you’ll see its name appear. Click and hold on a Dock item, and you’ll find options appropriate for it. For example, if you click and hold on the System Preferences icon, a list containing all your system preferences will appear, making it easier to go directly to the preference you wish to access. Click and hold on the iTunes icon once you've launched that program, and you get options for playing music in your iTunes library. Hold down the Option key while clicking and holding on an active application in the Dock, and you have the ability to force-quit the application. Now, let’s put one of these tricks to good use. Click and hold on the System Preferences Dock item, and choose Dock from the resulting list. The Dock system preference appears. It’s within this preference that you can make changes to the Dock’s behavior. The first option is Size. Move the slider to the left to decrease the size of the Dock. Move it to the right to increase the Dock’s size (up to the point where it can’t exceed the width of your Mac’s display). Next comes Magnification. 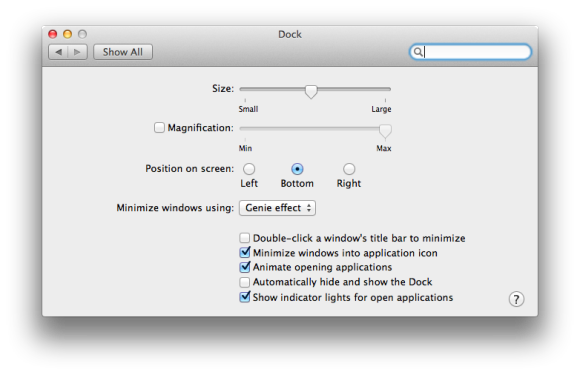 Turn this on and move your pointer along the Dock. As you do, you’ll notice that the icons near the pointer enlarge. You can choose the degree to which they’ll enlarge with the Magnification slider. This is a cool effect, but what good is it? In the Dock’s default configuration, which displays 18 icons, magnification doesn’t help much, since you can see everything in the Dock. However, once you add another dozen items or so, you’ll find that the icons within the Dock shrink in order to accommodate your new icons. If you add even more icons, distinguishing one icon from another becomes downright difficult, particularly on a small display. In these cases, magnification is your friend: Switch it on, and locating the item you’re after will become much easier. Although the Dock appears at the bottom of the Mac’s screen by default, it needn’t. In the 'Position on screen' area of the preference, click the Left option to make the Dock hug the left side of the screen (and lose its 3D countenance). Choose Right instead, and you get the same look on the right side of the display. Click Bottom, and the Dock returns to its original appearance and location. When you minimize windows they can disappear into the Dock with one of two effects (there’s a secret third effect, but not one we’re yet ready to look at). The default setting is Genie, and the other is Scale. You can try them for yourself by clicking the yellow minimize button of the Dock preference’s window. The Genie effect causes the window to compress at the bottom and appear to be sucked down into the Dock. The Scale effect maintains the window's current proportions and simply reduces its size as it moves to the Dock. If you’d like a better look at what’s happening, hold down the Shift key and then click the yellow button; this action causes the window to minimize in slow motion. To cause your window to reappear, just click its icon in the Dock (you can do this in slo-mo too, if you like). The options below are largely self-explanatory. Double-click a window’s title bar to minimize: Enable this option, and you can avoid that yellow minimize button. Just double-click the title bar of any window to minimize it. Minimize windows into application icon: If you want your Dock to be the tiniest bit tidier, enable this option. Now, when you minimize a window, it doesn’t appear in the right side of the Dock. Rather, it swoops down into the application associated with it. 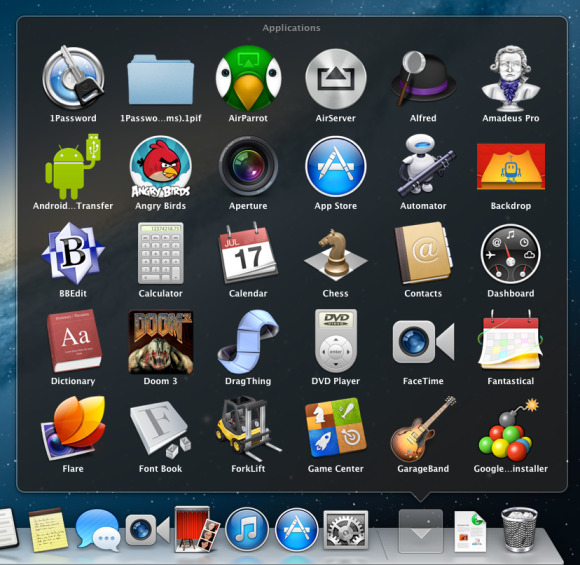 Click that application icon in the Dock, and the window reappears. Animate opening applications: By default, when you start an application, its icon hops up and down a few times indicating that the application really is launching and you should be patient. Turn this option off, and the only hint you’ll have that the application is going about its business is the small gray “light” that appears under the icon. Automatically hide and show the Dock: Helpful as the Dock is, it can get in the way, particularly when you’re working in windows that take up nearly the entirety of your screen. You can tell the Dock to scram by switching on this option. When you do, it will disappear into the bottom or side of your Mac’s display (depending on how you’ve configured the 'Position on screen' setting). To view the Dock, just move your pointer to the space it once occupied. It will reappear, ready to serve. Show indicator lights for open applications: I just mentioned those small gray “lights” that appear under active applications. Subtle as they are, you may find them distracting. If so, you can turn them off with this option. As much fun as it undoubtedly is to muck around in the Dock preference, you can access a few of its most important options directly from the Apple menu. After you click the Apple menu and select Dock, you'll find a submenu that contains Turn Hiding On, Turn Magnification On, Position on Left, Position on Bottom, Position on Right, and Dock Preferences. Choose the item most appropriate for your needs.